It came down to a few recommendations and price. Everyone I talked to recommended Narbik’s class. Everyone had good things to say about it, and said I should enjoy my time over there. I had a couple people recommend Internetwork Expert’s mock lab classes as well. Now I was actually debating about both classes. I hit a wall on the Internetwork Expert one though when I was advised I could not use my gift certificate credits towards the mock lab class by Scott Morris. I was kind of confused by this. I currently have $800 in my gift certificate balace over at Internetwork Expert. Now it may have become a no brainer if I could of used that $800 towards the class. Again I was advised that since the mock lab classes were so heavily discounted already that I wouldn’t be able to. What hurts even more is I have upgraded my end-to-end program twice already in less than a year. No big deal, I will just use half of my credits for mock labs. It just would have been nice to save a little more money since I have heavily invested in Internetwork Expert’s material already :). I guess I should sit down and work out a schedule the best that I can to go over Narbik’s Soup-to-Nuts workbook so I am up to speed for his class material. I have gone through Internetwork Expert COD’s twice now, and maybe will go through it again as well as beta workbook I. I will finish the workbook III lab I have started and start to work back to the workbook II labs.Â Hopefully I can get a schedule down in a week or two when the baby works out his! Josh over at Internetwork Expert and I just spoke and he wanted to clear up the confusion on what happened. I would of been able to use my credits, but somehow they were showing up as converted tokens to the sales agent. It is just a little tough because I would of loved to book the Mock Lab workshop using all the credits I had. Everything is booked except my flight plans for Narbik’s so that is good to go. I was actually just thinking of taking them both, but adding in another $1200 on top of what I just spent for Narbik’s would be over the top financially. Plus the wife would start to calculate her return on investment… Opportunity missed, but what can I do? I missed this post last week, but caught it from my igoogle home page. It is a interesting read.There is a good point made asking can you really test someone’s design ability on with a computer based test? 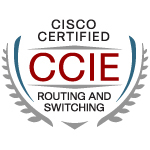 At the beginning of this year, Cisco launched the written test for its Cisco Certified Design Expert (CCDE) program, which lets IT pros demonstrate expertise in network infrastructure design principles and fundamental concepts. The missing piece â€“ until now â€“ was the practical exam. How would Cisco create a test to objectively measure network design, which some would argue is far from being an exact science? Cisco issued two new security alerts: one warning of default passwords in its Application Velocity System (AVS), and the other warning of a crafted IP packet flaw in its Cisco PIX 500 Series Security Appliance (PIX) and the Cisco 5500 Series Adaptive Security Appliance (ASA). That vulnerability could result in a reload of the devices. Can read the full article here.